Warner Home Video again does a fabulous job in bringing a "classic" film to Blu-ray with the second version of A Star is Born. If you're wondering why I placed the word classic in quotation marks, it is because this popular movie (especially in this restored version) has some deep flaws worth discussing. 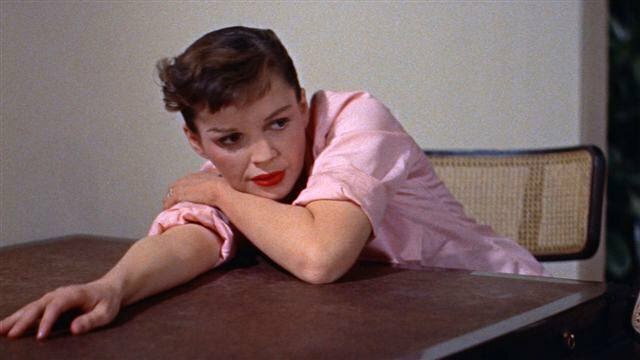 First and foremost, one should reflect on Judy Garland's performance, probably her best after her firing from MGM a few years before. As the up and coming Vicki Lester, nee Esther Blodgett, Garland is strongest when her character is putting on a show, singing and dancing through some musical number. Her pitch perfect belting of Harold Arlen and Ira Gershwin's "The Man That Got Away" not too long after the start of the film, is quite intriguing because of its darkness, laced with the disappointment of someone who's years of toiling in show business have given way to a certain cynicism regarding its rewards or lack thereof. The performance is even more amazing viewed in the context of six or seven alternate takes presented among the special features on disc 2, takes which illustrate the repetition often involved in creating a diverting scene, as director George Cukor (My Fair Lady) experiments with different lighting and costuming to achieve the proper atmosphere. In each take, Garland somehow manages to both perform almost by rote yet give each interpretation different shadings simultaneously. But these same takes reveal how mannered Garland's delivery is, with physical tics like a propensity to brush her hair up out of her forehead or a stiff-shouldered thrust of her arm which don't enhance the act as much as repel one away from it. In counterpoint to her costar, James Mason, who still plays the part of fading actor Norman Maine with theatrical panache, Garland desperately seeks the viewer's attention. This insecurity is especially noticeable in the early part of the film where she ostensibly plays an undiscovered starlet. Garland's years of addiction and hard living show, especially in high definition, where the then 32-year-old doesn't look a day over 45. Despite all that, Garland's profound effectiveness is evident when her ascent as Lester intersects with Mason's decline as Maine. Commiserating with studio chief Oliver Niles (Charles Bickford) over the sad downward spiral of her now husband Maine (pictured above), Garland breaks into a teary soliloquy which resonates most intensely because it is, in a sense, a self-revelatory lament on her own past—and unfortunately, future—struggles with the same problems. Like Garland masks her personal pain with her uneven portrayal of Lester, A Star is Born hides its darkness behind the tropes of contemporary musicals. "Born in a Trunk," a showstopper which serves as the cutoff point before the film's intermission, complicates the aesthetic of Cukor's film. Inserted into the movie against his wishes, it is easy to see why he objected; its colorful MGM musical stylings seem to play out of context with the rest of the film's darker tone. This even though it resides in Lester's first movie-within-the-movie as far as the storyline goes. The 15-minute medley stops the film cold. Yet it feels necessary in order to show off Garland/Lester's depth of talent, which thus far has only been getting a lot of lip service. The number ultimately led A Star is Born to an even lengthier running time of 182 minutes. At the time of its release, Warner Brothers cut about 30 minutes to squeeze in an extra showing at theaters each day, much of which has been lost. This restored edition tries to make up for it with some controversial stills of the missing scenes over the dialogue track. But ultimately, the story beats don't seem important enough to warrant the inclusion of the distracting photographs for any one but the most ardent of the film's fans. Just as the true measure of A Star is Born is found once one gets past its theatricality, one must look past Garland's stagey affectations to truly appreciate the vulnerability they try to cover up. Only then can one truly escape into the romantic tragedy so central to Cukor's film, and to Garland's later appeal. A Star is Born is available tomorrow on Blu-ray, DVD, On Demand, and for Download. What a fantastic review! This certainly has piqued my curiouisity to check out this disc. I've been hemming and hawing about getting Blu-ray player and this sounds like a good one to get. It sure is an interesting one, J.D. I find watching pre-Seventies movies on Blu-ray to be the most rewarding viewing experiences. They look so good it can really be revelatory. Thanks for the kudos, also. I see you've redesigned the blog! Me too - I had fun tinkering with Blogger's new templates. As for Star is Born, I find it interesting that in all three versions, an over-30 actress (in all cases, one who's been famous for at least 10-15 years) plays the young starlet. It's as if, age of the character aside, they needed somebody who understood that hard ascent to stardoom and the loneliness after the applause fades, from the inside out. I haven't seen the Striesand version, but between the first two (wasn't there another one too somewhere along the way or am I making that up?) I prefer the William Wellman version from '36. Very economical but still moving. I agree you have to have an actress with the requisite maturity to take on the part. It's just that Garland, while bringing a certain emotional truth to the role, looked a little too worn down by life at this point to properly convey the role of ingenue. The other version you're thinking of was WHAT PRICE HOLLYWOOD (1932), a film which was also directed by Cukor but is not an official source for any version of ASIB. Well, there is one that's been in the gestation stage for quite a long time. Currently, it has the unlikely couple of Russell Crowe and Beyonce attached. Brilliant review, I love this film and you have convinced me that the blu-ray version will be well worth buying! Is it fair to comment on a post from 2 1/2 years ago? I've only just stumbled upon it. Here's what I think isn't fair: judging a performance as it appears within the body of a finished film by what is revealed in outtakes, any more than it would be to evaluate how convincing sets appear onscreen from behind-the-scenes photos betraying their artificiality. Garland's "mannered...physical tics" - which become apparent only by viewing those outtakes - are akin to the bare 2X4's never meant to be seen, but which are necessary to support what is. They're valuable in historic and scholarly examination of how a performance - like a set - is constructed, but is it really proper to bring them to bear upon an assessment of the finished product, which deserves judgment upon its own merits? I don't mean to pick at you, but I also thought MovieMan's observation wasn't given due consideration, and you're perhaps projecting something upon Garland's role which was not intended. Esther isn't really portrayed as an "ingenue;" she - as suggested in her signature song - has "been through the mill." There are no fewer than four scenes (five if one counts "Born In A Trunk") emphasizing "how many years it's taken [her] to get this far," and "worn down by life," as you put it, is an entirely appropriate feeling for the character to convey. It also works especially well in reinforcing both Esther's enduring optimism, in spite of the dues she's resigned to paying (a reworking of a central theme from the '37 version), and the credibility of a more-or-less "nobody" springing forth into full-blown stardom when "just a little luck" finally comes along. This Esther is no starry-eyed innocent (a la Gaynor); she's a seasoned and even cynical ("I know...it won't happen") pro who perseveres while fully aware of the odds against her, and I don't believe Garland's looks are in any way at odds with such an understanding of the character.